I have finished and framed my latest silk painting, inspired by the autumn tree outside the studio window. I used a combination of outliner (gutta technique) and watercolour style…… the latter because I like free flow in my works. I must admit, however, that I am tempted to try the Sistek technique as I am impressed with many on the excellent works I have seen on the internet using that method. It means going back to being in control and I have worked hard to allow myself to enjoy a serendipitous approach. Anyway back to this work. It is the last show the tree puts on, full colour “party”, before it sheds the leaves for winter so I have titled the painting Pre the Winter Slumber . Tomorrow Keith (my husband) and I will make the trip to Scottsdale (about 5 hours round trip, plus stops) to a lovely gallery, Scottsdale Art and Framing, to deliver this (along with a couple of other works) for their winter exhibition. Looks like good weather so we will take the cameras. 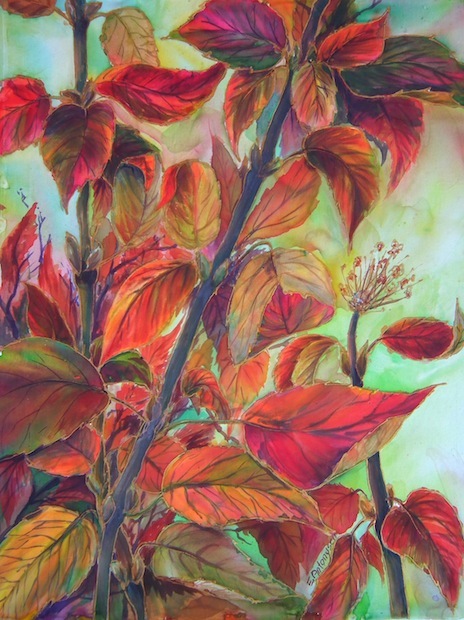 This entry was posted in art, painting, Silk painting, Tasmanian artists, Uncategorized and tagged autumn, autumn colour, autumn leaves, Fall, leaves, nature, scottsdale Art and Framing, Scottsdale Gallery, serti technique, silk painting, Tasmania autumn, watercolour on silk.